Break the End Crystals and shoot the dragon in the head to defeat this difficult adversary. There’s more to Minecraft than building shelters and hiding from Creepers at night. The game includes a variety of enemies that require a ton of skill the defeat. The big daddy of them all is The Ender Dragon, a fearsome beast with 10 attack damage and 200 health. You won’t see this creature flying around the world. You’ll need to find its home, otherwise known as The End. Even if you manage to get there, prepare to experience the toughest fight in the game, but don’t worry. We’ll tell you how to defeat The Ender Dragon and get the Dragon Egg. 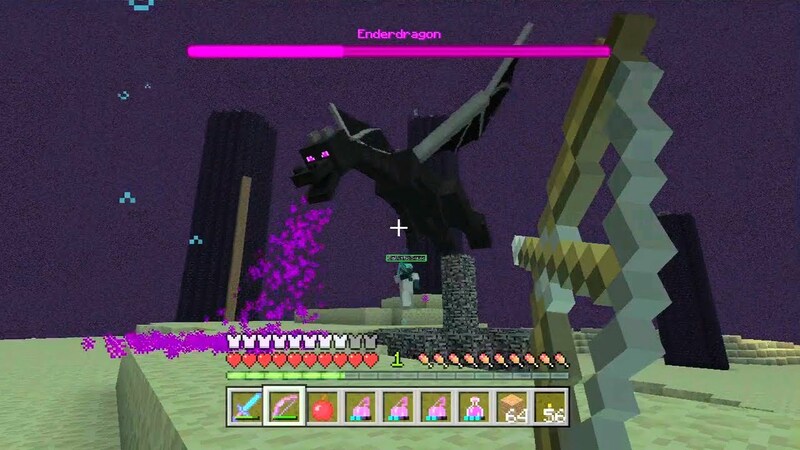 The Ender Dragon is so powerful it easily smashes through most blocks in the game, with the exception of Obsidian and the End Stone. You should make sure you have as much Obsidian as possible, then use it to build a tiny room next to the portal you spawned from. Additionally, place an Ender Chest in this shelter, which allows you to harvest End Stone and then bring this resource to the Overworld before engaging The Ender Dragon. Before kicking off the boss fight, bring a Bow with the greatest Power enchantment you can find; have lots of Arrows on hand as well. On top of that, you need a sword with a Fire Aspect or high damage. Reason being, you’ll need it to slay the Endermen lurking about; the sword is useless against The Ender Dragon. In regard to armor, equip Diamond Armor with Protection IV. A Pumpkin or Diamond Helm is good, but we think Diamond is the best way to go since it will keep you alive longer, whereas Pumpkin comes in handy for avoiding Endermen; look at these enemies while wearing a Pumpkin Helm and they won’t attack. If you don’t equip Pumpkin and look at Endermen, they come after you. You’ll probably need to heal at least once during the battle, so have Potions of Healing and Regeneration, along with some Golden Apples or Enchanted Golden Apples. Finally, Ender Pearls allow you to teleport from a smaller island to the main island if you somehow get knocked off the edge. When the boss fight against The Ender Dragon begins, make a point to destroy the End Crystals on top of the Obsidian Pillars. These crystals keep the creature close to max health, so it’s in your best interest to take them down. The best way to destroy End Crystals is to look for healing beams, then follow them back to the crystals. Pull out your Bow and shoot them with arrows until they blow up. With the End Crystals destroyed, go after The Ender Dragon with your Bow. Aim for its head for quadruple damage. To achieve headshots, wait for the boss to chase you, then squeeze off a fully charged arrow, then another as fast as you can. The Ender Dragon will flee and you want to go after it (yes, chase the monster) until it goes on the attack again. When this happens, do the exact same thing as before. Repeat until the creature falls. Gather experience from The Ender Dragon, along with the Dragon Egg. Click the egg and it teleports away from the End Portal. Do not allow the egg to tumble into this portal and break. You will need to search for the egg; look underground. Congratulations on defeating the Ender Dragon! Considering you found the boss, you probably know how to survive the night, yes? Use these Minecraft tips to build and battle your way to victory in Super League’s City Champs.